On August 22, 1974, Governor Ronald Reagan paid a visit to Covelo. He had taken a major role in the fate of the controversial Dos Rios Dam project, which would have flooded Round Valley and the town of Covelo. Richard Wilson had led the battle against the Army Corps of Engineers and their plans to build the dam and send the Eel River water south to Los Angeles. Reagan had sided with the conservationists, killing the water project, and so he wanted to see the valley first hand before he left the governorship. 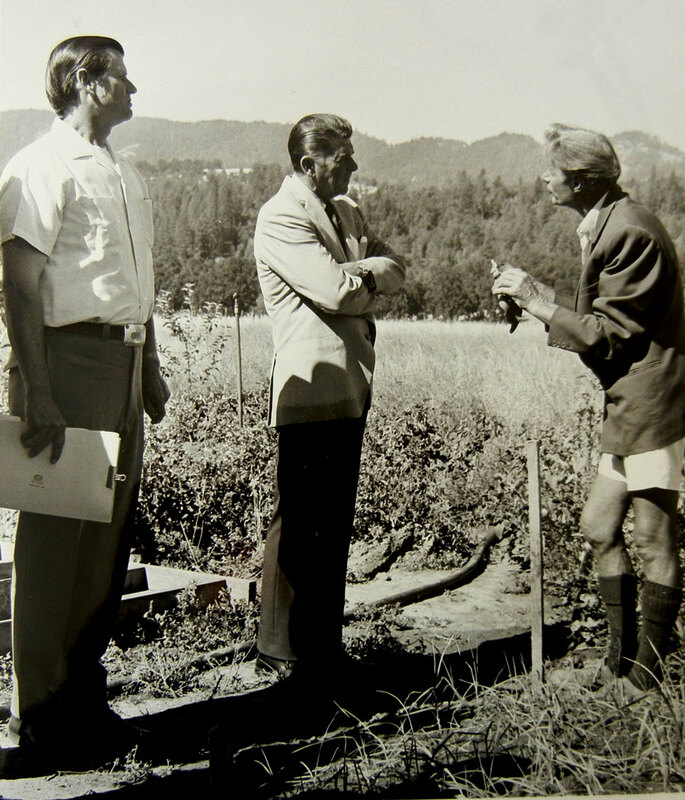 After lunch at Richard's house, Ronald Reagan and Richard Wilson dropped by the project to meet with Alan Chadwick and have a look around the garden. Reagan was impressed both with what he saw of the garden and with the hard-working apprentices that he met there. We reproduce here several photographs of Reagan, Wilson, and Chadwick. 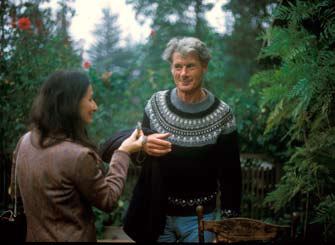 Below the photos on this page, we also include a brief extract from a much longer interview with Richard Wilson and the Regional Oral History Office of the Bancroft Library at UC Berkeley. In this extract, Wilson describes Reagan's visit to Covelo and the meetiing with Alan Chadwick. The full text of Wilson's interview can be found here. Alan Chadwick explains a matter to Governor Ronald Reagan under the watchful eye of Richard Wilson 1974. (Photo Lewis Butler) , Published by permission, courtesy of Richard Wilson. 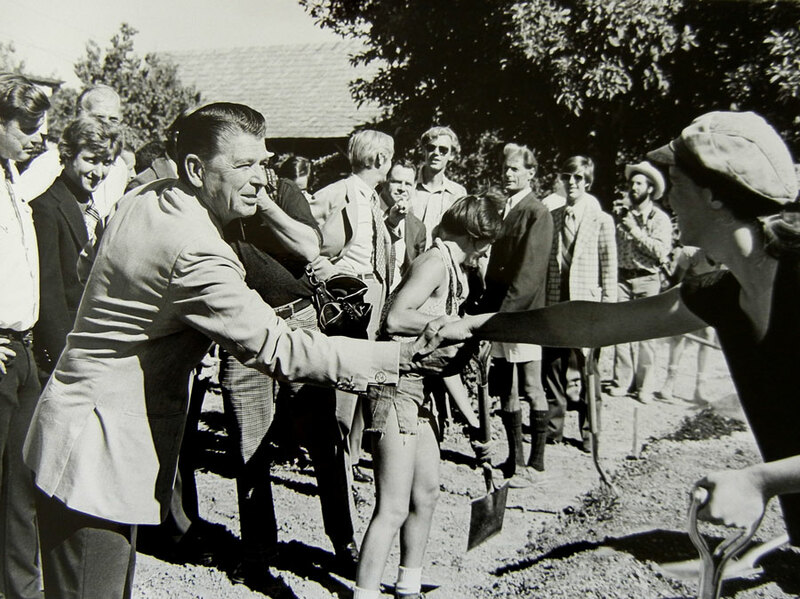 Governor Ronald Reagan shakes hands with a horticultural apprentice in the garden at Covelo. Alan Chadwick in background,1974. (Photo Lewis Butler) Published by permission, courtesy of Richard Wilson. 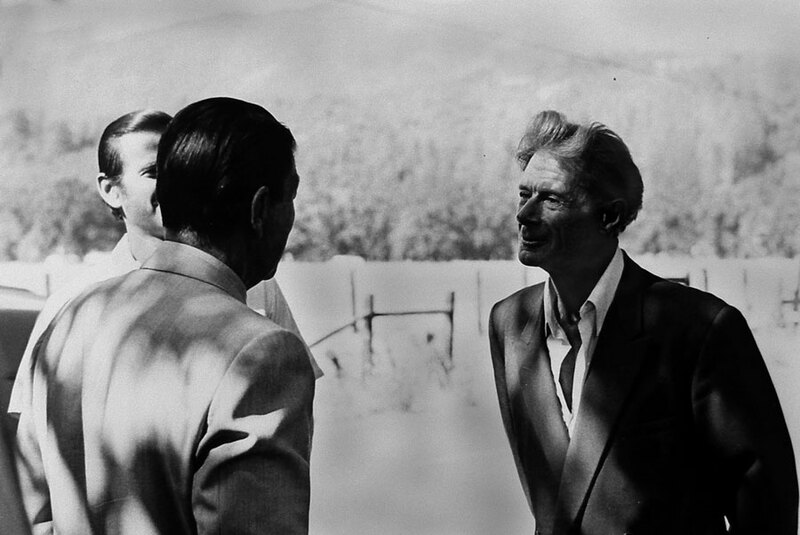 Ronald Reagan, Alan Chadwick, and Richard Wilson in conversation at Covelo, California, 1974. (Photo Lewis Butler) Published by permission, courtesy of Richard Wilson. and talk. Reagan's a very congenial type of fellow and can mix with anybody. Lage: He was referring to the whole entourage? Lage: How did he relate to the students? at Berkeley were not doing this. They were a very different type of creature." pounding some soil. It was really a—gosh, it was kind of fun to see it all. Lage: Did Chadwick behave himself? we've got that picture and I'll show it to you, the two of them.